If you are looking for a good tripod for a DSLR camera, Manfrotto is one of the good brand worth researching about. Manfrotto makes varieties of tripods for different purposes but you can select what works best for you and do in-depth research about it. If you are a serious amateur photographer or even new into photography, Manfrotto 190XPROB 3 Section Aluminum Pro Tripod may meet your requirement. 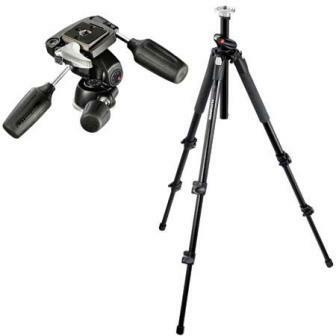 It is an aluminum made lightweight, sturdy, stable and flexible tripod. You can carry it around easily and take anywhere because of it's light weight. Manfrotto tripod gives you an extra feature with it's unique center column which can be adjusted vertically or horizontally both. This unique design allows the photographer to use the center column horizontally as an extending arm or vertically up and down to adjust the photographer's height. When used horizontally, the center column can be turned 360 degrees around the tripod, making it useful for macro work, low-angle shooting, extreme balance points and off-center work. Also changing the central column from vertical to horizontal position and back to the vertical is easy. When the central column is extended vertically up to its highest limit, you can bend the central column to make it horizontal without taking the camera off of the ball head. This feature saves your time and makes switching between the framing and the positioning more easier than ever before. The lock mechanism of the tripod legs works great as well. It can be locked and released in just few seconds without much effort. In addition, each of the legs can be set to different angle for more flexible, versatile positioning and allows you to balance the tripod on an uneven surface. You can set each of the legs to a different spread angle over the tripod's center of gravity which allows you to adjust the tripod to different heights. It is 48 inches tall with the center column closed, 57.5 inches tall with the central column fully extended and a ball head may add couple more inches. If your height is around 6 feet, this is a perfect tripod for you to see a viewfinder without bending. I like the fact that we can buy the tripod legs and ball head separately. This gives you the flexibility of understanding your need and determine which ball head serves you the best. It is one of the best tripod for all kind of photographers because of it's combination of the quality and the price.